How much soap would fit in this bright, shiny new mold? Photo by Flickr member Judi Cox. Used under a Creative Commons License. If you’ve ever found yourself in this situation, you’re not alone. Figuring out how much soap will fit in a mold, like Marie Gale might say, is not complicated, but it is very detailed. Now, you can easily use an online calculator (here, here, here) to size your soap recipe to your mold, but just in case you desperately need to make soap when the power’s out, here’s an explanation behind the math. In order to figure out how much soap will fit your mold, you first need to figure out the volume of your new mold. Assuming your beautiful, shiny new mold is a rectangle (or a square, which is technically also a rectangle), this is easy. Measure the inside length, width, and height of your mold in inches. Below, we’ve made up some numbers so that you can follow the calculations. Multiply those numbers. This gives you the volume in cubic inches. Unfortunately, I don’t know many soapmakers working in cubic inches, so let’s convert cubic inches to ounces. One cubic inch equals 0.554113 ounces, so we can multiply the volume by 0.554 to convert from inches to ounces. If you are making a cold or hot process soap and want to estimate just how much oil to use, Member David Fisher has an easy to follow guide. Have you ever made way too much or too little soap to fill a mold? Nope, got it to work. Thanks! I believe the last calculation should be multiplying by .9 not dividing. I found on other websites that total weight of oils is calculated by multiplying volume with 0.4 . i would believe version written here, because most of oils density is 0.9. so why is the 0.4 used? Typically, folks are using 0.4 as a rough shortcut that combines the conversion from volume to weight, accounts for how much of a soap recipe is typically “the oils”, and some fudge factor to avoid overfilling the mold. We went for a calculation that would give you a total recipe volume – no doubt you’ve noticed that the oils make up roughly 60-70% of a recipe. 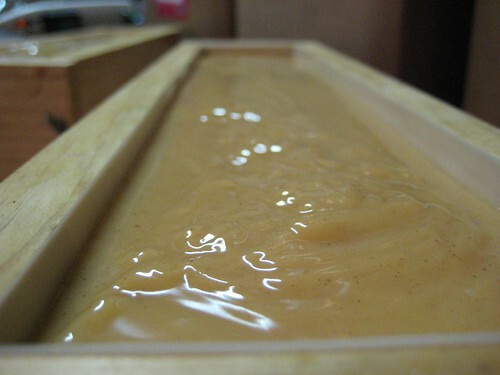 Often, though, it’s a lot easier to know how much oil you can fit in a mold instead of knowing how much total soap will fit in a mold, so the 0.4 ends up being faster and easier to deal with. Hopefully that shed a little more light on the subject! I just want to say THANK YOU!!! I make salt bars so I cannot rely on just the volume of oils route since the salt adds so much volume at the end. I LOVE your way much better!